HARMLESS THOUGHTS: "True Brotherly Love"
I thought this was so sweet! Samuel and Josiah beat me downstairs this morning and I was so touched by what I found a few minutes later after I came into our living room. 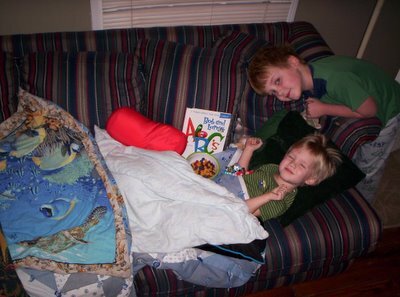 Samuel had prepared the couch just the way JoJo would like it with all of his favorite things. New favorite book, favorite cars, favorite cats, favorite pillow, bowl of favorite cereal, favorite cartoon on the tv, and of course, all the best blankets in the house! I'm a little jealous, too! Are you sure it is not Samuel who is sick? we have played "pass the cold" around here for weeks, I could ship a few to you and you and Sam could take care of them for me! All I know is that when I am sick, I get to reap the benefits!